LifeStyle Thursdays: Guilt Free Muffins! For today's Lifestyle Thursdays I want to talk about food! I mean why don't I talk about food more often?!!! When I was trying to lose weight before the wedding I went on a no carb diet for six months. I felt great! However.....after the wedding the moment some fresh bread entered my belly I was like no carbs what?!!! I tried to have some cheat days and I would always end up with a bad stomach ache and bloating the following morning. After no cares given and several tummy aches I finally decided to go back to eating healthy but I wanted to try something new ( fyi I am constantly changing my diet). I went to Barnes and Nobles and found a Paleo diet book. I was intrigued and curious about the recipes and this lifestyle. I purchased the book, went grocery shopping the following day and have been trying recipes now for the past two months. I want to add that I have a Type A personality which means that when I become obsessed with something I go all in and there is no stopping me! Some of my favorite paleo recipes are the baking ones. I love making delicious desserts that are gluten free, grain free and also sugar free sometimes. 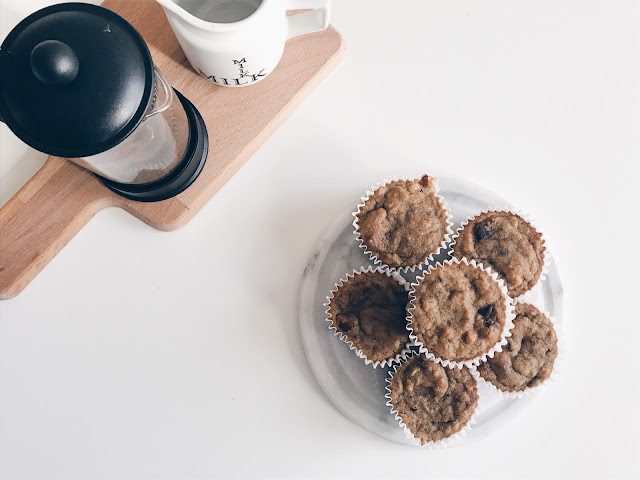 This week I was craving muffins and opened up Pinterest and found walnut banana breakfast muffins. I decided to give it a go but added some semi-sweet chocolate chips and I loved the way they turned out. Moist and yummy! No sugar added except from the bananas and chocolate chips. They are a perfect hectic morning on the go snack or a after dinner with some tea snack! Plus I love how there isn't much guilt after eating these muffins. I don't always make paleo food such as sometimes I cook dinner meals with brown rice but I like switching it up. I also am not going gluten free extreme. When I first tried the diet and I was consistently staying away from gluten I would wake up with a stomach ache that felt like a cramp. I am not sure where that came from, hence I didn't go to my doctors so I stopped trying to purchase everything gluten free and my stomach is better now. I am back to feeling good, no bloating or stomach aches anymore. I actually hate using the word diet I prefer to say I am making healthier life choices for my husband and I. I have back off a little of being so obsessed with dieting and trying to train my mind and my impulses to just focus on health and incorporating vegetables and fruit into our daily lives. At one point dieting was all I was thinking about (hence you can check out my Pinterest and see my Paleo Pin Board I quickly made!) I guess the moral of my long rant is: Food is fun don't make it stressful! 1.) Preheat oven to 350 degrees and grease a 12 cup muffin tin. 2.) In a mixing bowl, whisk together the coconut flour, salt and baking soda. 3.) In another mixing bowl, beat together with a fork the eggs, coconut oil, honey, mashed bananas, and vanilla. 4.) Add the wet ingredients to the dry ingredients and beat with a hand mixer on medium speed for about one minute or until well combined. Then stir in the 1/4 cup of walnuts. 5.) 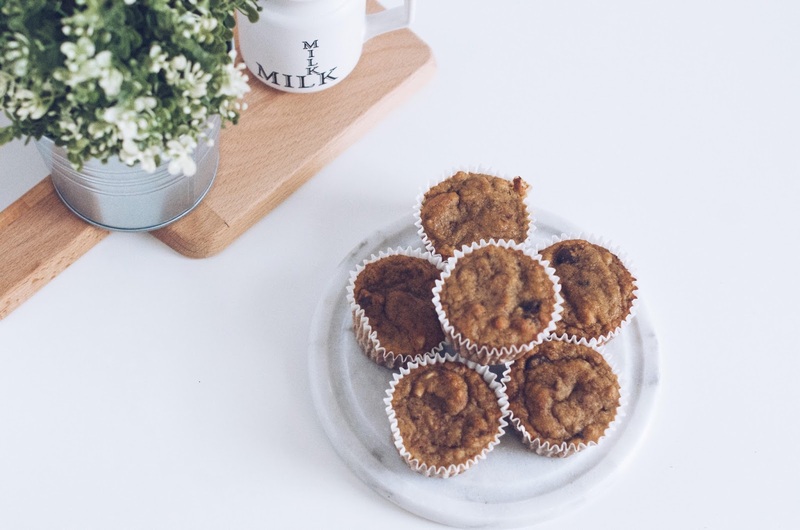 Spoon the batter evenly into 12 muffin cups and sprinkle the remaining 2 tablespoons of chopped walnuts on top. 6.) Bake at 350 degrees or 20 minutes. Let the muffins cool in the pan for about 10 minutes, then transfer to a wire rack to cool completely. VIOLA you have delicious guilt free muffins!!!! For more information you can visit glutenfreehomemaker.com for the recipe. If you guys want to see more recipes let me know in the comment box!